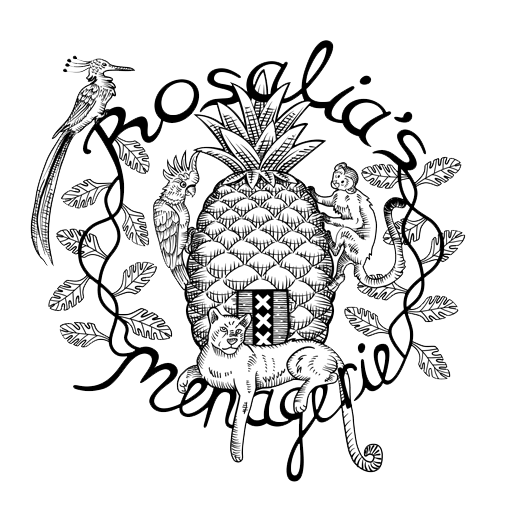 Rosalia’s Menagerie is a cocktail bar inspired by Dutch heritage with its rich history in the trade, distilling, and innovation. Established in 2017, our cozy little bar is located on the principal floor of an inn on one of Amsterdam’s oldest canals. We invite you to join us for a leisurely journey through our drinks and bites. We look forward to sharing our passion for Jenever and great locally-made spirits with you, as well as, showcase extraordinary products from abroad. We are a cozy living room. Following these guidelines at the Menagerie will help all of our mythical creatures remain happy. Want to know more about Rosalia? Download our press kit. curiosities that I have gathered during my travels. many varieties, as a base. As the flavors of this malty distillate vary greatly, we have presented the cocktails with flavor descriptions to keep the unknown accessible. The ingredients of the cocktails are not a secret, just ask and we would love to tell you all about them. Forgotten animals, mythical creatures and old traditions. For reservations, please contact us on Facebook Messenger or call us. Parties of up to six people welcomed.